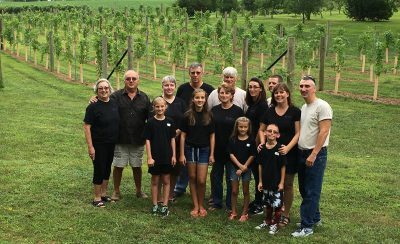 Backyard is a small, family owned vineyard and winery located in Maryville, Missouri. It began as a retirement project by our father, Carl Christensen. Starting off as some fun cleaning up the land, or as he calls it, “playing in the dirt.” His love of the outdoors and his green thumb inspired him to dive in further and start this journey that pulled us all together to create this beautiful vineyard and some terrific Missouri wines. 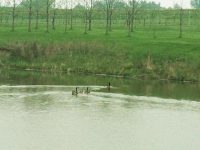 With the help of family and friends, Carl transformed the land from a mess of tangled trees and a growing pile of junk, into a very serene acreage with approximately five acres of grapevines intertwining three ponds. 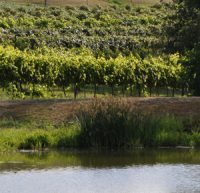 The first vines were planted in 2008 with additional plots added in subsequent years. Currently we have seven varieties totaling around 2600 plants. Come out and enjoy the freedom, fresh air and peacefulness northwest Missouri has to offer. 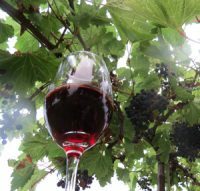 Grab a glass of wine or one of our tasty wine slushes and take a stroll through our well kept vineyard, pitch a blanket and have a picnic, or sit inside our one-of-a-kind tasting room and enjoy an afternoon or evening of card or board games with friends and family. Host your own event here!